This is Universal Pancake load / force transducer suitable for testing purpose. It is capable to measure compressive and tensile forces. It is strain gage based sensor with temperature compensation over 0 to 60 Deg.C. 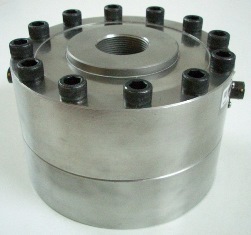 This is supplied with base plate for universal force measurement purpose in force calibration laboratories. It is designed for dual bridge configuration for sensor redundancy. It is very rugged and accurate. For your such application,we can supply as per your dimensions. Suitable mounting / loading hardwares can be offered optionnaly.